Special guest at the event was Hot Sails Maui founder Jeff Henderson. On a quick stop in the UK, Jeff headed down to Worthing to get involved in the action and pulled out a very respectable 6th place. Read all about it here. Reporting on the BWA back-to-back events at Rhosneigr and Brandon Bay is a disappointed Ben Proffitt. The defending UK Champion hasn\’t kicked off his competition season as he\’d like to, read all about it in a classic Proffitt report here. The AWT introduce a fresh face as part of their \’Rider of the Week\’ series. In for questioning this time around is newcomer Jordan Reid. Read all about his plans for this year, his history and what\’s in store by clicking here. UK Starboard/Tushingham rider and super-coach Sam Ross has just completed his \’Seven Days of SUP\’ challenge. Paddling 134 miles in aid of a great cause, Sam finally finished up in Poole Harbour and was treated to some nice waves to celebrate on. Check out some more shots on his Facebook page and if you fancy supporting Sam\’s charity of choice, click here to donate. The Starboard team are happy to announce the first official race series for the Phantom 295 raceboard. Finland will play host to the first event in June, followed by more action in Holland in August and a third event to be scheduled in Thailand. Running alongside the ISAF Raceboard Worlds in Finland, the events will have 40 sets of gear available to charter for any visiting sailors, hopefully ensuring a great turnout. Click here for more details. Club Vass in Greece are stoked to have opened their doors for the season as the first guests arrive. It looks like the wind has turned on, check out instructor John Newby flying in Vassiliki and keep an eye on the Facebook page for all the latest updates with some epic photos from Globalshots. Out sister site Boards.co.uk have what promises to be another excellent LiveChat lined up tonight. 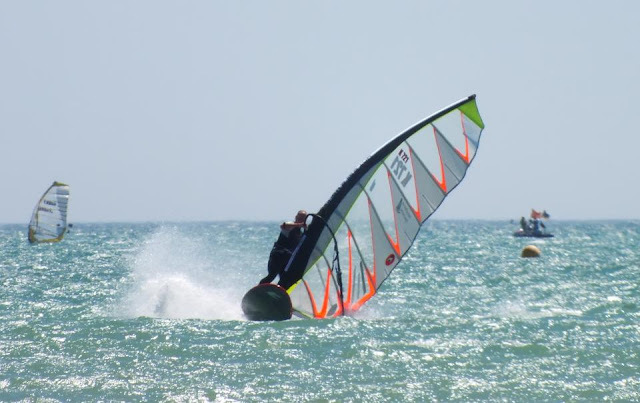 It\’s the turn of Ross Williams today, so click here to check out all the hot gossip from the freshly crowned European Formula Champion and PWA Wave ripper tonight at 6.30 GMT.